You are here: Home / News / Blog / Management / When Was the Last Time You Sharpened Your Ax? 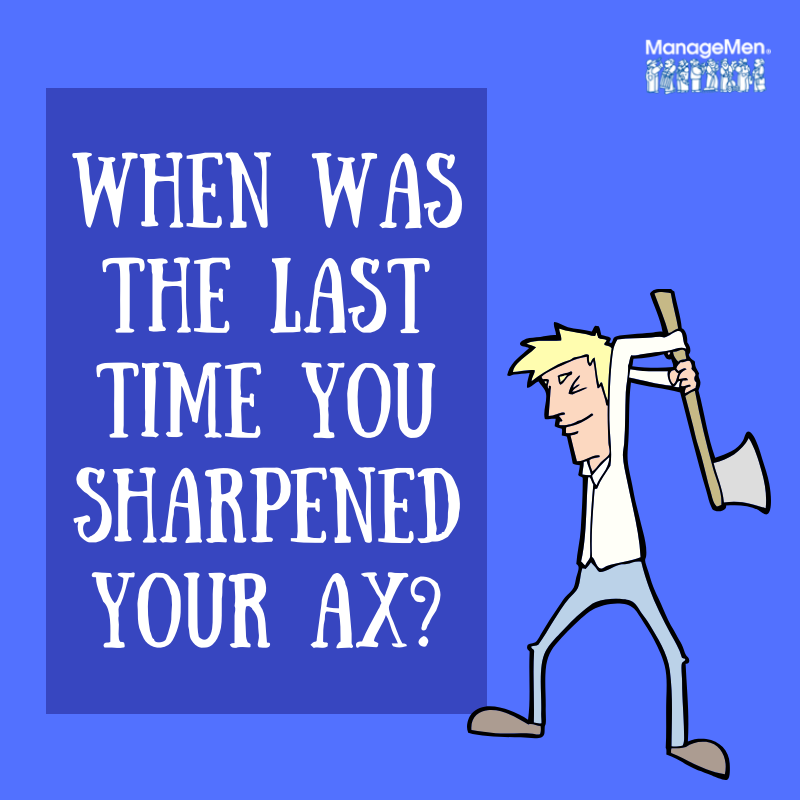 When Was the Last Time You Sharpened Your Ax? You may have heard the story about the man who works hard chopping wood, but never sharpens his ax? In the tale, a man goes to work for a local timber company. The job pays well and the management is friendly, so he wants to do his best so he can keep the job. The first day, he manages to cut down 18 trees. Proud of his accomplishment, he goes out the next day with the goal of chopping down even more trees, but it turns out that he’s only able to chop 15. With each day that passes, the man cuts down fewer and fewer trees. Feeling defeated, he goes to his boss for advice on what he could be doing wrong. 1. Maintaining good care for your tools and equipment. How can we clean faster with dirty tools and equipment? A lot of organizations come to us looking to improve cleaning efficiencies and make their operation more productive. And not surprisingly— “improving staff performance/cleaning times” was the top priority cited by respondents to this year’s Facility Cleaning Decision’s Reader Survey. So when we go into a business, one of the first things we do is take a look at the custodial closet. Why? Because it gives us clues into the way the custodial department is managed. A lot of times, we find that custodial workers aren’t “sharpening their axes”—or keeping their tools and equipment clean. We see mop buckets filled with black water, soiled cloths, cob-web covered dusters—the list goes on. How can a janitor possibly “clean” if the tools that he or she uses are dirty? If you were an artist, would you paint with dirty brushes? Aside from obvious cross-contamination issues, if we don’t take the time to care for our cleaning tools, they will generally degrade over time and become less effective. This applies to everything from cleaning cloths to large capital investments like auto-scrubbers or carpet extractors. Every productive, efficient cleaning organization will have a program in place to make sure tools are regularly cleaned and a preventative maintenance program is in place to keep cleaning equipment in top condition. 2. Maintaining good care of our mental and professional health. How can we be our best if we don’t take the time to refresh our own professional development? 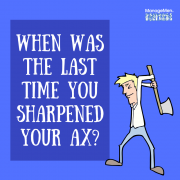 The metaphor of “sharpening your axe” can also be applied to continuing your own professional training and education. Studies show that organizations that invest in training are often higher performing (you may want to check out this post, where we identified 10 reasons why you should make continuing education a priority.). We use the term “training” loosely here, as it can mean anything from reading industry publications to stay up-to-date on custodial management best practices, to participating in webinars, in-person training programs and industry trade shows. However, professional development is only part of the equation. Finding ways to improve your mental health is an important way to sharpen your ax. According to the American Psychological Association, 58 percent of Americans say that work is a significant source of stress. Some people go golfing, fishing, running or kayaking to decompress from the rigors of work and life demands. Others practice mindfulness, yoga or spend time writing or reading. Whatever your outlet, make sure you take time to step away in order to best care for your own mental well-being. In the ever-present push to clean faster and better, we need to take a minute to make sure we’re sharpening our axes. Otherwise, we’ll never get anywhere. https://managemen.com/wp-content/uploads/2018/11/Ax-Sharpening.png 800 800 Andi Curry https://managemen.com/wp-content/uploads/2015/06/ManageMen-trans.png Andi Curry2018-11-15 18:48:482018-11-15 18:48:48When Was the Last Time You Sharpened Your Ax?